EDITOR’S NOTE: Many thanks go out to the readers who pointed out the striking similarity between this bag and one made by the talented Pascale from //between the lines//. Craft Gossip linked out to Pascale’s bag last March (see the post). The project at Good Housekeeping came to my attention yesterday and, while the slashed t-shirt knit reminded me of Pascale’s bag, I thought it was nothing more than a coincidence. In a creative community, ideas often travel around between designers as each puts their own spin. It was not until I saw the comments from our readers and viewed the two projects side by side on my computer that I saw just how similar the two projects are. I cannot speak to the motivations of the folks at Good Housekeeping, whether they intended to copy the original by //between the lines// or not. In fact, with no date appearing on the Good Housekeeping post, I cannot make a definitive statement regarding which post was published first. What I can do, though, is thank everyone again for having Pascale’s back and making sure that she gets credit for her very creative idea. This is what I love about the creative blog community! And for those who haven’t seen it already, check out Pascale’s Quick Fix T-Shirt Shopping Bag. 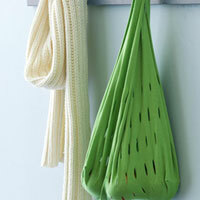 Good Housekeeping has a tutorial for making an ec0-chic shopping bag out of an old t-shirt. It’s a quick project, requiring just a few seams and cutting a lot of slits. Get the how-to. Good Housekeeping, it’s not very nice take the work of “Between the lines” and not credit her work! Shame on you for the blatant rip off! I really expect more from you and your editorial staff. this is a great idea repurposing old t-shirts & saving on plastic shopping bags. I have made one last March using the original tutorial for this on the blog Between the lInes. Try this tutorial if you need pictures to help you along, it is very detailed. WOW that is an exact COPY! What a shame the original source is not even mentioned.